Members belonging to Loksatta political party on Saturday, 6 July 2013, protested against the hike in BMTC and KSRTC bus fares. They gathered at Shanthinagar bus stand and distributed pamphlets to bus commuters and the public. They raised slogans against the government for not reducing the burden on public. Party members submitted a memorandum addressed to the CM. The protesters submitted the memorandum to Mr. Nagendra, Divisional Traffic Officer at BMTC. The memorandum noted that more than 40 lakh people use the services of BMTC everyday, making it the most important backbone of mobility in the city. It also suggested alternative measures to cover the expenses of BMTC, rather than increasing the fare. The suggestions included introduction of a subsidy of 200 crores for BMTC in the upcoming Budget presentation, and introduction of paid parking on public roads, which will cover the cost of subsidising the public transport. “We must never put the working poor of our city to this hardship. Transportation is an essential part of their efforts to better themselves and their families. 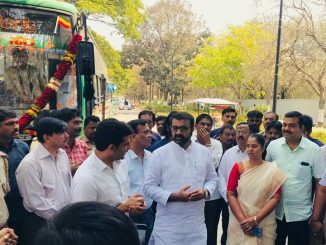 We must give them every chance to preserve their money for basic needs and for things that create lasting value… Please announce an annual operational subsidy for BMTC, and for other city transport services in the state, and link this to lower fares,” the memorandum urged. This article comes to Citizen Matters through Msg Forward; a service that allows citizens and organisations to issue announcements to the public. This content has been provided by Anand R. Yadwad of Loksatta and published as-is. Is the BMTC indulging in price-gouging? Bus travellers in Bengaluru claim that BMTC is charging more than it should. Ticket from Kundalahalli to Majestic shows 24 km when it should be 17.5 km.